Accurate Multi-Carrier Real-Time Shipping Rates, Built In! Shippingcalc by Auctioninc in X-Cart 5. 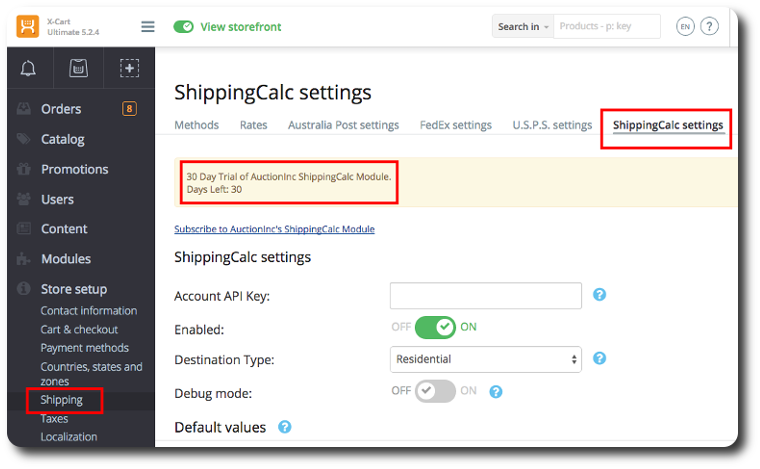 The ShippingCalc module is now available and enabled by default in all X-Cart 5 stores starting from version 5.2.5. In simple words, your customers can have access to instant comparative shipping rates from multiple carriers (DHL, FedEx, UPS, USPS) by registering for one account with AuctionInc. The module is easily enabled to work with your available shipping methods, simply select the methods you would like to offer and proceed to the ShippingCalc settings to customize your shipping plan. Get Rates! It will give your customers the ability to choose the shipping method they prefer and one that is in their price range. After the 30 days trial period is over, or if you decide to get access to premium subscription-based features earlier, follow the “signup” link to provide your personal and business details and get an account. Why we believe that this integration will make your life better? ShippingCalc powered by AuctionInc is loaded with advanced features. Their technology is both complex and unique in its capability to generate rates for orders that must be packed into multiple boxes. Starting in 2015, both UPS and FedEx are using dimensional rates for all packages and services. This extension adds critical support for collection of your item dimensions, this allows ShippingCalc to determine package size and generate accurate shipping quotes. Intelligent “packaging engine” determines appropriate boxing for each shipping service for any given set of items and quantities. Carrier accounts not required; start offering accurate rates immediately from your choice of our supported services. Domestic and international services supported from any origin. Accurate rates for Drop-Shipping from multiple origins in the same order. Versatile settings for adding handling (item, package and/or order level) and insurance. Offer shipping discounts for a selected service category based on cart threshold. Whether you have just started your online store or already have a well-establishe business, these guys can help you turn your shipping expense into shipping revenue. Offering accurate shipping rates and options to your customers is a powerful way to decrease shopping cart abandonment. Use ShippingCalc to “Take the guess out of shipping”. 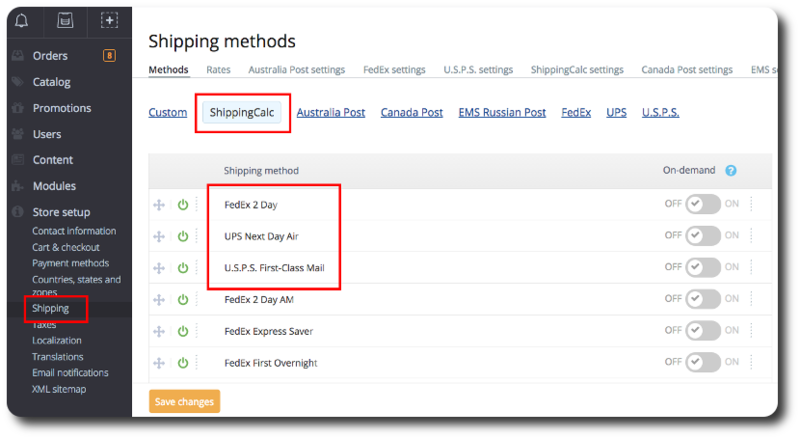 To get started just select ShippingCalc on your X-Cart 5 Shipping Set-Up Page. If you’re using X-Cart 4, don’t get upset too: the integration module exists (a good one! ), thanks to our well known partners BCS Engineering!